Offering you a complete choice of products which include sieve shaker. With the help of our efficient workforce, we are able to manufacture an array of Sieve Shakers that is used for bench mounting. Our shakers are known for their compact design, light weight, portable tendency, accuracy in functioning and high mechanical strength. These are manufactures using quality components and spares, and are designed at par with indian and international quality standards and norms. 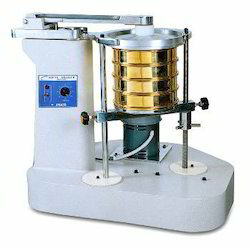 Looking for Sieve Shaker ?